How do I see what Social Media accounts are tied to my website? How do I see what Social Media accounts are setup for my website? Step 1) In a web browser go to your website. Step 2) Scroll to the bottom of your website and then click on the Social Media link in the footer of the website. 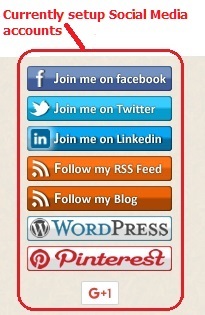 Step 3) You should now see a list of the Social Media accounts associated with your website.